By effectively drawing heat away rather than shocking your body with uncomfortable cooling, the CoolQuilt is a safe and comfortable solution to heat stress. The blanket offers cooling relief without the use of gels or refrigerants, using instead the three-layer evaporative cooling material for which Silver Eagle Outfitters is known. 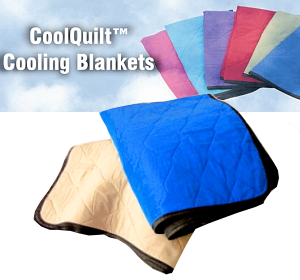 Using regular tap water, the CoolQuilt is easily activated in 5 minutes for hours of heat-relief. Silver Eagle Cool Quilts are a safe and easy way to keep you cool on a hot day. You will enjoy hours of cooling relief and protection from the summer heat. Carry the CoolQuilt when travelling to keep comfortable on planes, trains, and in cars. When exercising or working in extreme-heat conditions, keep the blanket in a cooler of water for emergency heat-relief. Because of the CoolQuilt's consistent cooling, it is effective in relieving aches and pains due to illness or exhaustion.